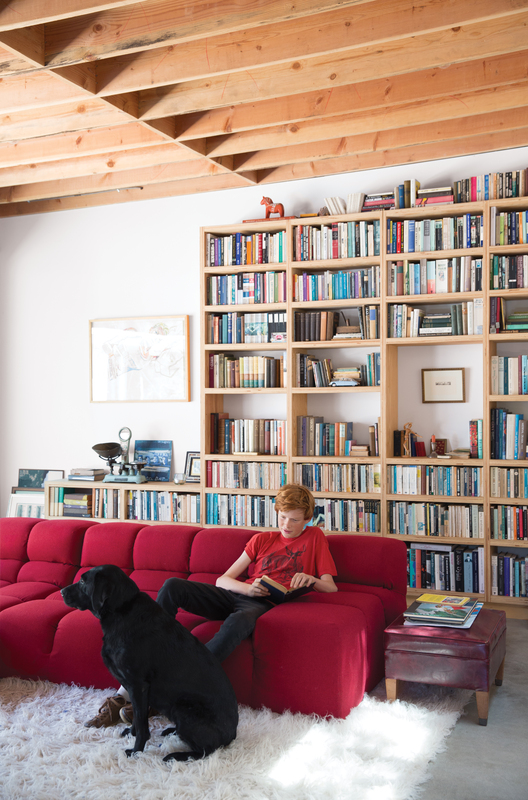 Wes Mahony lounges on a Tufty-Time sofa by Patricia Urquiola for B&B Italia in the family room that architect Emily Jagoda created for his family in their tree-damaged garage in Santa Monica. The door to Eoghan Mahony’s office is set on a caster and has a hinge that runs the entire ten-foot height. 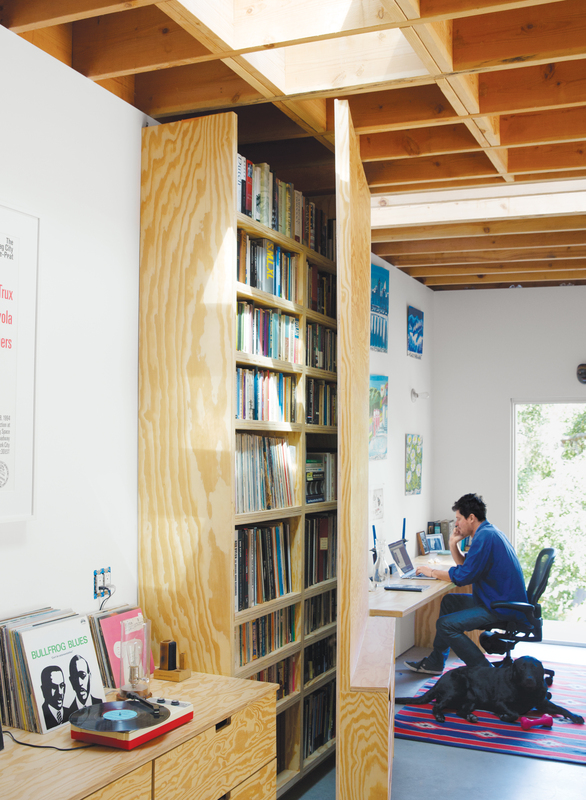 Designed by Jagoda, the door swings open to fit in front of a bookshelf. Landscape designer Jay Griffith recreated the area between the house and the studio. May, a freelance book editor, and Mahony, a television writer, called on architect Emily Jagoda, who had designed an addition to their previous home. After sizing up the two-car garage and the dark, low-ceilinged workshop alongside it—about 600 square feet in all—Jagoda came up with a design for an informal retreat that would accommodate a comfortable family room, a pair of offices, and a bathroom. Rebuilding on the original footprint, this time with ten-foot-high walls, was the first step. A shared office was briefly considered, but the long, narrow workshop felt more like a hallway, so Jagoda borrowed a few feet from the garage and carved out two separate offices, leaving enough square footage for an economical bathroom in between.